Buffalo is fortunate to have fine examples of every architectural style popular in the United States from the early nineteenth century to the present. Two styles that dominated the country between 1820 and 1860 were the Greek Revival and Gothic Revival. Part of the broader Romantic Movement in literature, painting, and music, both revival styles left Buffalo with such landmarks as the Wilcox Mansion and St. Paul's Cathedral. The Greek Revival is the closest the United States has ever come to having a national architectural style. Many in the young republic prophesied the United States as the next Athens, her freedom sparking a new golden age of culture. Mixed with this cultural optimism was another connection with Athens, the country's democratic form of government and the birthplace of democracy. This political association was reinforced by the Greek revolt against the Ottoman Empire during the 1820s. In short, what architectural style was more appropriate for the United States than that of classical Greece? Such historic associationism was one of the strongest characteristics of the early Romantic revivals. All sorts of buildings, houses, churches, schools, banks, offices were built like Greek temples, with a row of columns or pilasters supporting a triangular pediment above. 110 Franklin Street is an excellent example. 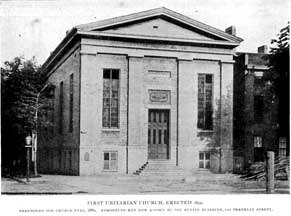 Constructed in 1832 as the First Unitarian Church, it is the oldest standing building in downtown Buffalo. A newly elected President Abraham Lincoln, accompanied by former President Millard Fillmore, worshiped here in 1861. When 110 Franklin was sold and converted in 1880 to an office building, the building was raised one story and extended westward. Whereas the original building had been rather stark, decorative detailing such as dentils and modillions were added to the pediment, and a very un-Greek Italianate treatment was given to the third floor windows. However, despite the great changes to the building, a Greek temple front is still clearly visible on the Franklin Street façade. An older house, say one built in 1838, could be easily updated in the latest style by applying Greek elements to the façade. An example of this would be the Wilcox Mansion at 641 Delaware Avenue. Built as officers' quarters in the Poinsett Barracks, it became a private residence in 1847, and not too long after a two-story pedimented portico supported by Doric columns was added to the Delaware Avenue side of the house. A private residence demands something a little more fashionable than does an officers' quarters. Interestingly, a Palladian window, a central arched window flanked by two narrow rectangular windows, a Renaissance detail, adorns the pediment. Though many early Buffalo mansions and buildings were built in the Greek Revival Style, almost none remain in the city as they were torn down in the nineteenth century to make way for an expanding commercial downtown. By the 1830s and 1840s, many architects and clients had begun to look back to twelfth to fifteenth century Europe for inspiration. The English Gothic was used to clad the rebuilt Houses of Parliament in the 1830s in London, England. What style could have been more appropriate for the English Parliament than the Gothic, with its origins back in the English middle ages? At the same time, what style would have been more inappropriate for a government building in the United States, where the Middle Ages were associated with the despotism of kings? It was in churches that the Gothic Revival Style found greatest popularity in the United States. The Gothic became the style of choice for new Anglican churches in England in the 1840s as advocates argued it embodied the values of the great age of Christian faith. The strongest champion of the Gothic Revival in the United States was Richard Upjohn, and English architect who emigrated in 1829. Nationally known after the completion of his Trinity Church in New York City in 1846, it is not surprising that Upjohn was approached by the rapidly growing Episcopalian congregation of St. Paul's, Buffalo, to design a new, larger church. The first starchitect to produce work in Buffalo, Upjohn outdid himself with St. Paul's Cathedral, completed in 1851. Upjohn considered St. Paul's to be his greatest work, principally because of how successfully he accommodated its awkward site. Set on a triangular lot, the church's nave, towers, and chapel all fit comfortably, as if no other arrangement would have been possible. The Church recalls an English parish church in its irregular, asymmetrical arrangement. A Gothic church on the continent, for example Notre Dame in Paris, was typically situated prominently on the city square and announced itself to the world with its symmetrical front façade of tripartite entrance and flanking towers. An English parish church, in contrast, was often located on the edge of the village, nestled against a wood. The massing was irregular, and the entrance was far more modest. On entering St. Paul's, one's eye is pulled forward and up, upward toward heaven. The spans of stained glass both illustrate the scriptures and fill the space with a luminescence that could only be the presence of God. To my mind, these are the essential characteristics of a Gothic cathedral. However, to most deeply experience this space, one must hear it filled with Gregorian chant or other early music. I suggest attending service or one of the wonderful concerts offered at St. Paul's. After a devastating gas explosion and fire in 1888, St. Paul's was rebuilt by Robert Gibson. The exterior walls and towers remained. Gibson introduced a few modifications, principally in making the interior more spacious and ornamental. Of course, the windows all had to be replaced as only a few, now located in the Church Street entrance, survived the fire. 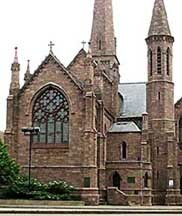 Not long after St. Paul's Cathedral was completed, St. Joseph Cathedral was built as the seat of the Roman Catholic diocese of Buffalo. Designed in 1851 by Patrick Keeley, the leading architect in the Roman Catholic tradition in the country at the time, St. Joseph follows the continental Gothic tradition with its prominent symmetrical front entrance. A second flanking tower was designed but never completed. The Gothic Style was also very popular for residences, especially rural cottages. Alexander Davis and Andrew Jackson Downing both advocated it for its picturesque qualities rather than for any historical associations. With its wood construction and asymmetrical massing, a Gothic cottage set quite nicely into a woody suburb. These houses often sported board and batten walls and tall, pointed arch windows. The newly invented scroll saw made fancy verge boards relatively inexpensive. The finest example in Buffalo of such a house can be found at 60 Arlington Park. The house Millard Fillmore bought for himself in 1858 on Niagara Square was quite appropriate for its more urban setting. Constructed of stone with crenelated towers, the house stood proudly on its corner until torn down in 1921 to make way for the second Statler Hotel. The Gothic Revival Style continued to be used for churches throughout the nineteenth and into the early twentieth century. It was favored by the Arts and Crafts movement by its associations with the handcraft and social relationships of the medieval guilds. University Gothic of the 1920s harkened back to the great medieval universities of Paris, Oxford, and other European cities. Finally, Gothic was also employed in such early skyscrapers as the Woolworth Building in New York City, for some years the tallest building in the world. In Buffalo, a good example of what may be called commercial Gothic is the telephone building on Church Street, next door to the Guaranty Building. The narrow clustered columns rise into the sky, emphasizing the building's height. It is Gothic's verticality that made it so useful for skyscrapers. I wonder what, if any, historic associations could be made. The worship of money, perhaps, as commercial office buildings came to soar over neighboring church spires.